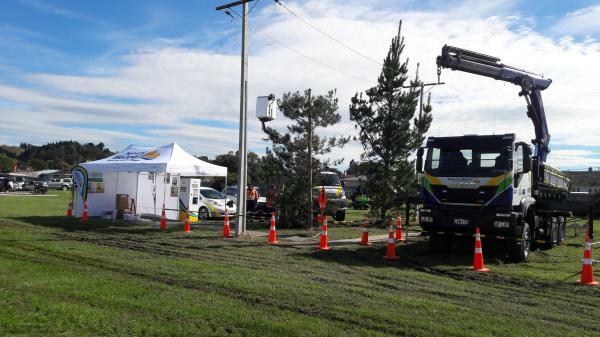 Network Waitaki’s winning display at the 2018 North Otago A&P Show Highlighted the Dangers of Trees Around Electricity Lines. Network Waitaki was the proud winner of the 2018 North Otago A & P Show Trade Exhibition Challenge Trophy for their stunning visual display erected to highlight the dangers of trees close to power lines. As beautiful and useful as trees are when they come into close-proximity to power lines it causes a lot of problems as well as being an issue to people and animals safety. Staff on site were passionate about explaining the dangers surrounding trees in and around power lines and were pleased with the responses from the public to Network Waitaki’s message. The newest to Network Waitaki’s fleet and displayed for the first time. Both trucks will be commissioned into the fleet to start their working lives following the display at the show. An IVECO 4X4 Bucket Truck. An IVECO 6X6 Crane Truck. The Nissan Leaf which is a fully electric and the Mitsubishi Outlander - Hybrid. Both cars are part of the Network Waitaki fleet and used constantly by staff. Also on display was a mock-up Charging Station to show what they look like – in fact - Network Waitaki now has 4 charging stations throughout their network. We all enjoyed our time at the 2018 North Otago A & P Show and we hope all the visitors to our site enjoyed their time with us and found it informative.